Everyone on the Internet is in a rush. Whether they’re browsing on a computer or a mobile phone, visitors to your site expect content to appear at lightning speeds. Hence the need for websites which render well on a variety of devices and window or screen sizes. When your website receives thousands of visitors every day, the underlying infrastructure must be able to support the traffic. High traffic means a large number of simultaneous requests from users expecting fast load times. Delays can cost you visitors, reduce revenue and undermine your reputation. Therefore the websites have to create a design which can handle high traffic and be responsive in order to cater to a larger clientele. But the question is how does responsive web design work? Responsive sites use fluid grids. All page elements are sized by proportion, rather than pixels. So if you have three columns, you wouldn’t say exactly how wide each should be, but rather how wide they should be in relation to the other columns. Do people looking for a certain material on a mobile want the same thing as those using the full site on a desktop? How will the content served differ between devices? Large images and other media can be scaled down to fit smaller devices, but how do we combat the page bloat and slow site speed that this can create? How do web developers produce content that looks just as good on large desktop displays as it does on small devices with different pixel densities? How can we test a responsive web design website on all of the different devices on which it might be accessed? All of these challenges all boil down to one thing: Different devices. This is the area a responsive website aims to conquer. In order to achieve that there are certain factors that you need to take into account for generating a best possible user experience. Taking a smart approach to high traffic website maintenance cuts down on the load from a large number of visitors and ensures peak performance from your site. For you as a growing business visitors are God. Failing to meet the expectations of the visitors can mean missing out on huge profits. For e-commerce websites, losses are reflected in low revenue and less trust between consumers and brands. If you’re selling products and services but slow load times are driving potential customers away, you could be missing out on a lot of business. The same is true for any form of revenue you bring in from your high traffic site. Slow speeds and the resulting drop in visitor engagement means fewer people clicking on ads and making purchases through affiliated links. Credibility suffers when user experience is poor. An appropriate hosting plan is required to manage high traffic. A shared hosting plan is not something you can rely upon when your site grows bigger. You need something more reliable. You need to have a plan that has the bandwidth to handle high traffic. The host, can , penalize your site if it uses more than its allotted share of server capacity daily. The best host for your site is one with the ability to handle the highest number of visitors you expect to receive and still deliver superior result. Opt for plans with adequate RAM and bandwidth, and check the average page load speed to determine if it’s fast enough. Pages with a great deal of scripts or media are more likely to be slow to load. The easiest way to make your websites responsive is by making the page designs simpler. Note : Keep mobile users in mind as you implement these design improvements. Page loading speed matters even more for mobile visitors as they’re not going to wait for a media-heavy site to load when they could go elsewhere to find what they need. CDN refers to Content Delivery Network, a collection of servers that are spread around the world and used to optimize content delivery for local visitors. Using CDN is another approach that high traffic websites can take. A CDN caches static files across multiple servers and delivers them from the location closest to each visitor to eliminate as much lag time as possible. Choosing the right CDN is a good idea if your site hosts content or media with a frequent number of viewings. The reduced latency decreases page load times to give users the content they want as quickly as possible. To be a responsive website you need to cut down on your content delivery time. File compression is another useful tool for this purpose. Many high traffic websites and top website builders like WordPress.org , WordPress.com , Go Daddy enable compressors like Gzip compression, CSS compressor, Google Closure Compiler etc to reduce file sizes during retrieval and delivery. Gzip, for example, works by searching for duplicate strings within a file and then replacing the second string with a pointer to the previous string. this method can reduce file sizes by 70 percent, resulting in a significant increase in load speeds. When your responsive website is up and running, it brings in a lot of benefits not only for the users but it has plenty of SEO benefits too. Google loves responsive web design! Therefore, every small change you make to optimize your high traffic website improves user experience and decreases the likelihood of visitors abandoning pages due to slow load times. Greater satisfaction among visitors translates into improved performance for content, products, and services. Orange county web design, a CA based company, for example, offers custom built responsive web designs. They believe that responsive layouts provide a fast and unique interface. Having a separate desktop and mobile site requires separate SEO campaigns. Merging them together makes it far easier and accessible. But again why should we take all this pain? This is a time-consuming and, not to ignore, a pretty expensive process. The process of design, creation, implementation and testing asks for excellent skills and expertise. But what many people fail to realise is how this initial investment can provide them with a brighter future. It’s not just the SEO and user benefits that make responsive web design rewarding. By creating one responsive web design codebase, there is no need to maintain two or more codebases for each of the different devices throughout the life of the website. This is substantial to cut costs in the long run. So the cost is actually justified! The reality is that mobile responsiveness is not just about smartphones anymore. More and more people are using tablets. 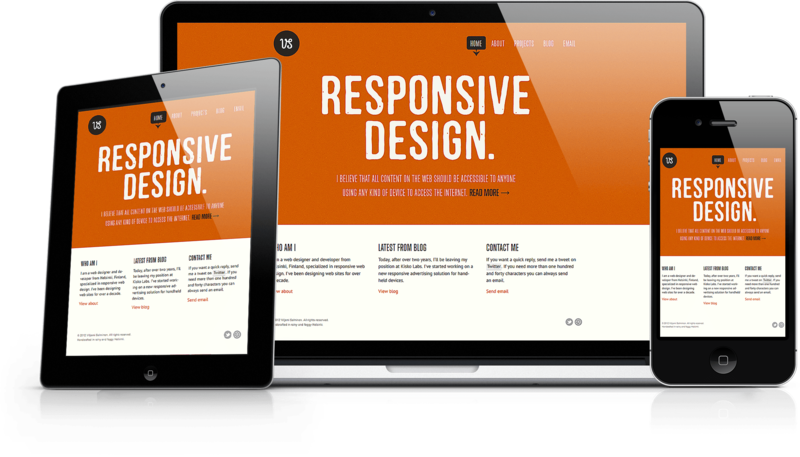 With all of this, having a website that is responsive is becoming a requirement, not an option. Not everyone is connecting to the mobile web on a high speed connection. It is still vital to keep the size of your website down so that you have the fastest possible page loads. With that being said, the benefits of responsive website design, when implemented correctly, far outweigh the negatives and if you are working toward creating a new website it is something that you should strongly consider.